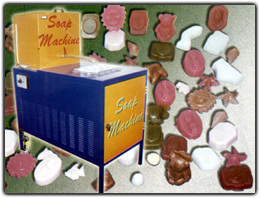 With this Kilindas machine, you can manufacture several types of soap and toilet soap, with different colors and fragrances. This machine, with capacity for 20 liters, set up and temperature control, may produce from 200 to 500 parts/hour, depending on the size and format. We provide all raw material, as well as a course on the handling of the equipment and soap and toilet soap manufacture. * One (1) year guarantee against manufacturing defects. Accompanied by a kit containing 10 different forms, 5 kilos of toilet soap mass and 1 tube of essence.